Gary Sredzienski, a well-known musician and swimmer in Kittery, Maine, has made an unbelievable commitment to the American Lighthouse Foundation and Friends of Portsmouth Harbor Lighthouses -- he's swimming 4 miles in 35 degree water on Feb. 26, and playing a concert the same day! Gary's really dedicating himself to our cause, and I hope people will honor his commitment with donations. We're aiming for $10,000! As of Feb. 12, we're a little more than 1/3 of the way to our goal of $10,000 for this event. If everyone who cares about lighthouses could donate even a few dollars in honor of Gary's commitment, we'd have a fantastic total! Just over a week to go and we're just about halfway to our goal of $10,000. 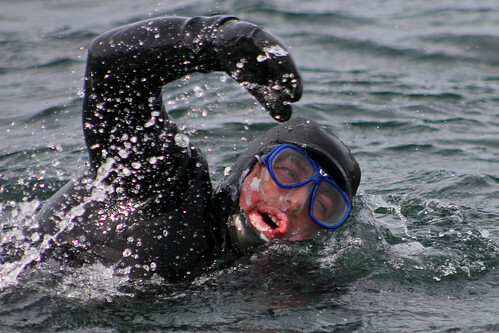 The coldest water I have swum in was 49 F without a wetsuit - lasted 30 minutes. Gary did it! He completed the 4-mile swim in a bit over 2.5 hours. I was out in the support boat, and I can honestly say it was the most inspirational thing I've ever seen in person. You can't imagine the effort Gary put into it. Got this message from Gary last night: "Everything worked out so beautifully. To have such an experience and to benefit others at the same time brings me an immense joy."